Let’s start this new year with an innovative use of the wonderfully aromatic herb, Hoja Santa. It’s traditionally always served cooked, but here I make it into a salad, paired with equally aromatic fennel seeds and cold-weather greens. I think that Hoja Santa will become a big hit in the coming years, as more of us Chicanos, Latinas, enter the culinary world and share new ways of enjoying delicious food that is historically tied to this hemisphere. The origin of Hoja Santa is tropic Mesoamerica which includes Southern México, Guatemala, Panamá and Northern Colombia. From ancient times, we used it for medicial and spiritual healing. Crush a leaf between your fingers and you’ll get a heady aroma of root beer. Grow a plant in your back yard, as I do, thanks to a dear friend, Dr. Ellen Riojas Clark from San Antonio who gave me one from her garden as a Christmas gift. It grows well in our southern US climates. 1. In a skillet, toast the fennel seeds until they turn color and release aroma. Then crush them in a molcajete or other mortar & pestle. 3. Prepare the Hoja Santa by first removing the stem, cutting both edges with a sharp knife as shown in the picture above. Then roll the hoja into a tight little cigar and slice it very thinly into threads, ribbons. 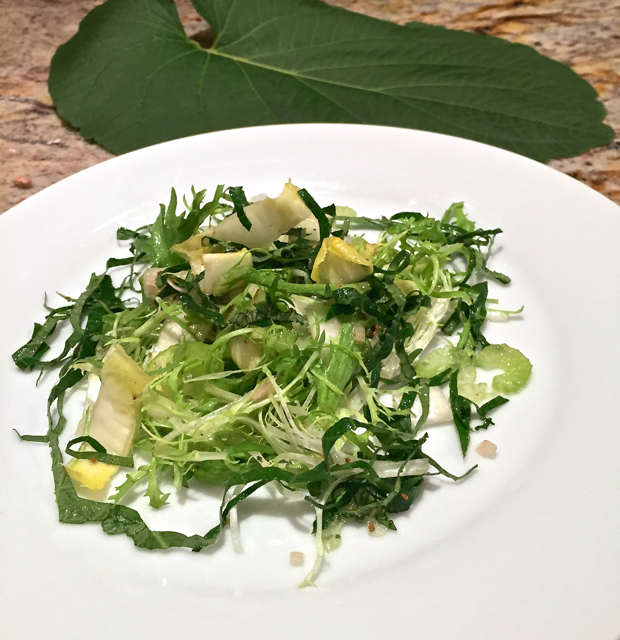 The French call this technique, “chiffonade.” By slicing it this way, (then soaking in the dressing as described below), the coarse leaves become quite a nice raw addition. 4. In bowl or wide-mouth jar, combine the lemon juice, salt, sugar and shallots and stir or shake until the salt and sugar dissolve. Then add to the fennel seed olive oil and whisk or shake vigorously to emulsify. 5. Soak the hoja santa strips in the dressing for 15 minutes, then add the other greens and toss well to coat. ¡Buen Provecho y Feliz Año Nuevo! This salad dressing recipe is an adaptation of one that I first saw about 10 years ago in Gourmet magazine. Sad that it stopped publishing.